Directed by Paul Thomas Anderson, Junun is a documentary film that follows Radiohead guitarist/composer Jonny Greenwood, Radiohead producer Nigel Godrich, Israeli composer Shye Ben Tzur, and the Rajasthan Express making an album at Mehrangarh Fort in Rajasthan, India. It’s a film that follows the creative process into making a record featuring a few outsiders who know little about the traditional music of India. The result is a fascinating and engrossing film from Paul Thomas Anderson. 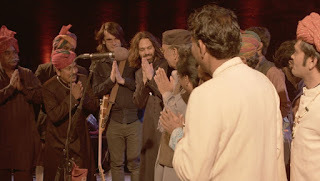 Shot through digital camcorders and a drone belong to music producer Nigel Godrich in early 2015, the film follows the making of an album produced by Godrich that features Jonny Greenwood and Shye Ben Tzur making an album with the Rajasthan Express at the Mehrangarh Fort in Rajasthan, India. There, filmmaker Paul Thomas Anderson and a small crew would capture the recording process as well as what musicians had to do when there’s no electricity or running water during the process as it’s something Greenwood, Godrich, and Tzur would deal with. Yet, it would only inspire them even more as they become in tune with the local musicians and the location itself. With Anderson, Godrich, and a few others serving as the camera operators throughout the film, they showcase this unique world where the fort is on top of a mountain. Anderson would use the drone for some unique aerial shots to capture the city of Rajasthan as it has these gorgeous wide shots while he would go for medium shots to capture the performance where he would have a camera in the middle of the circle to capture all of the musicians playing. Some of it would be in long takes while Anderson with the help of editor Andy Jurgensen would create edits that play into the music as well as how they would build a studio in the fort. Sound mixer Christopher Scarabosio would help capture the recording process and how Godrich would mix the music with the vocals recorded at one session and the music for another on a few tracks. The music in the film is a major highlight as its mixture of traditional Indian music with horns and electric guitars from Greenwood and Tzur create something that is just intoxicating and exciting to listen to. Junun is a marvelous film from Paul Thomas Anderson. It’s an engaging documentary film that captures not just a unique world outside of modern society but also the music and how vibrant it is in an era that expects everyone to keep up with the times. In the end, Junun is a remarkable film from Paul Thomas Anderson.